Can you believe we have had 19 snow days this winter? I can’t remember a year we have had that many in a long time. I have used several of these days to do projects around my home that have been on my to do list, and organizing closet and other areas. We have this buffet in our dining room that we definitely need for storage, and I spent a few hours emptying it out and re organizing it one day. 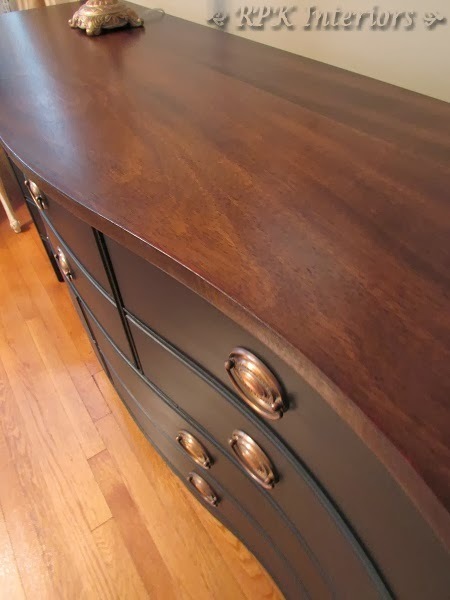 I recently showed this buffet on my blog and asked for advice on what I could do with it. You can read that post here. At the bottom of this post, I will show you my most recent inspiration I have found for what to do with it! These top drawers are a catch all for everything. Seems like they are the first drawers my family goes to to look for something or stash something. Do you have drawers like this in your house? They eventually get so full I can barely shut them! I forgot to take pictures of them before I began emptying them. Bad, bad blogger! You can see the garbage bag I was tossing everything into. This double decker drawer organizer is one that I have owned for several years. It works perfectly in the right hand drawer. It just needed some re sorting, as it does every once in a while. Here is the left hand drawer after I was finished. I went through every single pen and tested them to make sure they worked. There is nothing more frustrating than grabbing a pen that won’t write! Agreed? So, you can see I separated my pencils and pens. You will also see extra staples, glue, measuring tapes. There is also a DVD cleaning kit, some extra light bulbs, and camera. Just some odds and ends, but MUCH better after purging a lot of it. This is the right drawer after I re organized. This double decker just holds odds and ends of small nails, screws, paper clips and other supplies. To the right are extra tissues that I keep in my car, scentsy warmer bars, and picture hanging supplies. And there is even lots of extra room to put other things in. The middle drawer houses cloth napkins, table cloths and runners, maps and travel books, some paper supplies, and grilling utensils. There was plenty of room left in this drawer after the purge as well. That makes me very happy! There is also an extra extension cord and a wine glass rack that hangs from a cabinet or shelf. I used to have it in my kitchen at our old house, but can’t find a place for it in my new kitchen. But I don’t want to part with it, because I may find a use for it some day. Sparklers anyone? On to the bottom cabinets! This side of the cabinet houses our sewing kit, extra hand soap, empty jars, and extra candles. I will find a use for these jars one day I am sure!You can also see our fuzzy moving coasters that we use to move heavy furniture on the wood floors. Love those things! I will find a use for these jars one day I am sure! The middle cabinet holds our food processor, some water bottles, some extra decorative stuff and puzzles. This is also the cabinet where I put plastic cups if I happen to have any left over from a party or something. The left hand cabinet holds old VCR tapes that have family stuff on them. I need to get that stuff transferred to our computer someday. The basket on the bottom holds flash lights and batteries for the flashlights, and the two folders to the right hold all of our owners manuals. I also did a purge on them when I cleaned out this cabinet. I want to thank everyone who gave me advice on what I could do to refresh this cabinet. So many good ideas! 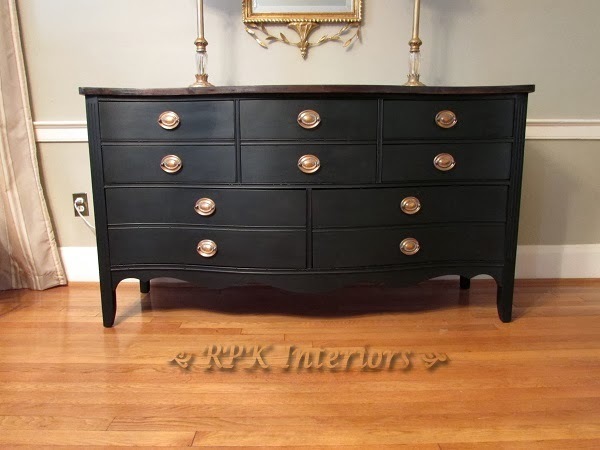 Last night, I saw a dresser on Savvy Southern Style that was very similar in style to this buffet, and I fell in love with how she refinished it. Take a look. It even has the same hardware as mine does! Isn’t it beautiful? I love it so much. the only problem is that I currently have a black desk and shelves in my dining room, so I think it may be too much black in one room. What do you think? 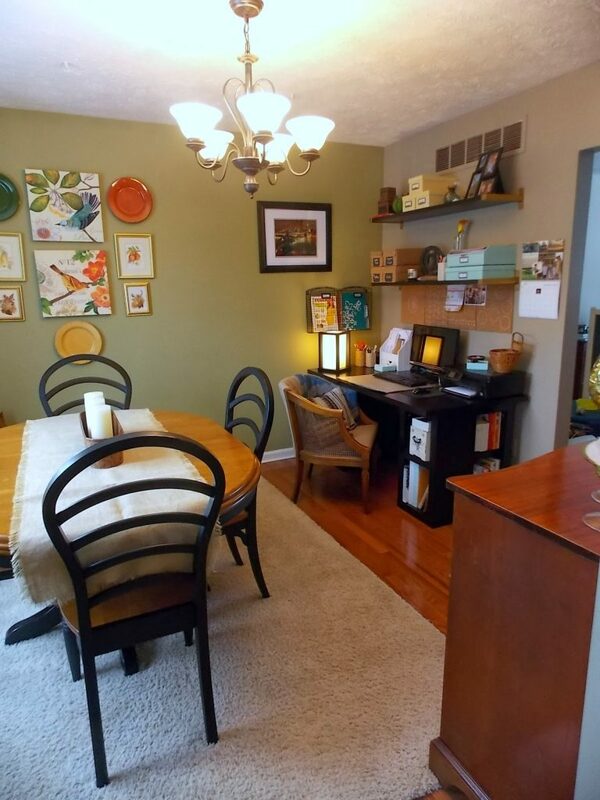 Here are a couple of pictures of my dining room, in case you have not seen it. There is also black on my dining table, which doesn’t concern me as much, because it needs a makeover too, and I can paint out the black. 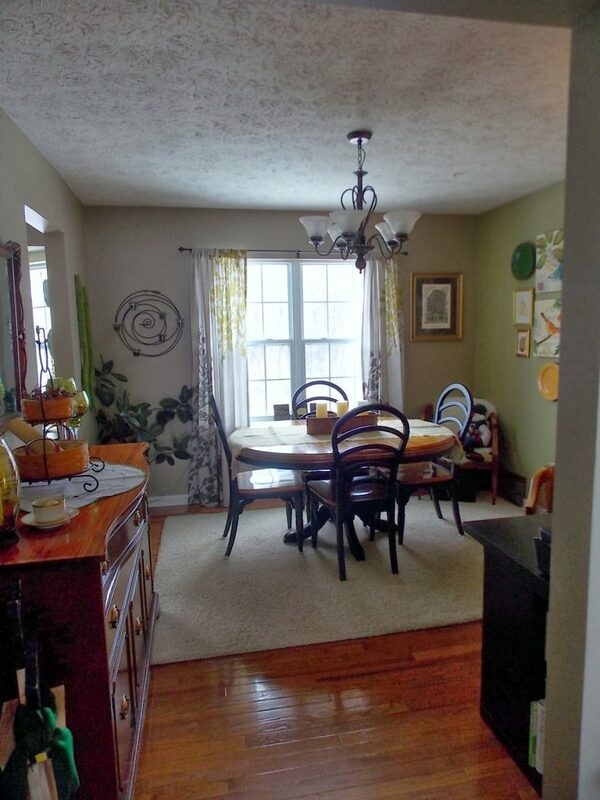 Let me know in the comments how you think this paint treatment would look on my buffet, in this dining room.